Enjoy the spectacular views of both the Pacific Ocean and Mar de Cortes in the gorgeous Hacienda-style 6 bedroom Villa Maria in the gated community of Pedregal, only a few minutes of downtown Cabo San Lucas. 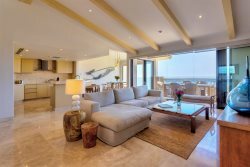 High ceilings, marble floors and a stylish living room with pocket doors that opens to beautiful ocean views will take your breath away. The state of the art kitchen with high end appliances has access to an quaint outdoor courtyard with a table for six, a majestic stone fireplace and nearby grill. Enjoy your beautiful sunsets on the exterior terrace which includes infinity edge pool and spa along with a fire pit and seating on the lower terrace. The villa has 4 interior bedrooms beautifully decorated along with 2 exterior Casitas for a total of 6 bedrooms, there are 5 King-sized beds and and 2 Queen beds. LIFESTYLE Villas and Villa Maria await you.